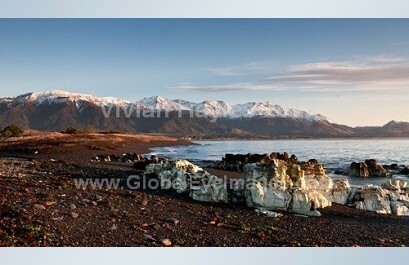 New Eco tourism in Kaikoura Stock Photos. Travel Photographer Vivian Hayles has just published a new set of Eco tourism in Kaikoura stock photos.The beautiful town of Kaikoura on the east coast of the South Island of New Zealand is a veritable treasure trove for those interested in larger forms of sea life – whales, Southern Fur Seals and dolpins to name a few. A deep sea trench near to shore brings an abundance of marine life for viewing by boat or helicopter or eating – Kaikoura translates as 'meal of crayfish'. A turquoise sea, ice-capped mountains and black beaches provide an amazing visual backdrop for eco or family tourists alike.Vivian Hayles Stock Photography.